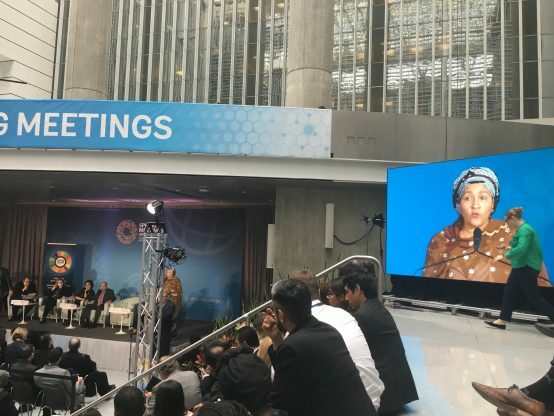 UN Deputy Secretary-General Amina Mohammed speaks on the challenges of 'greening the economy' at the 2019 Spring Meetings. Credit: Bretton Woods Project. On the side lines of the 2019 World Bank and IMF Spring Meetings, the Finance Ministers of the V20 proposed new instruments to tackle climate finance shortfalls. A press release from the V20 published on 11 April noted, “V20 countries face considerable barriers such as higher costs of capital in financing that affect both resilience and renewable energy projects, as well as huge inefficiencies when attempting to access international climate finance.” In response to this, the release announced that, “the V20 has proposed the ​Accelerated Financing Mechanism (AFM) for Maximal Resilience & a 100% Renewable Energy Transition ​to upscale existing risk mitigation tools, guarantees and blended finance facilities, and a new menu of instruments within MDBs [multilateral development banks] and other development banks for adaptation, resilience and renewable energy projects.” The release also announced the creation of a Sustainable Insurance Facility (SIF). The need for finance to urgently address countries’ climate transition policies, as well as finance for the interlinked Sustainable Development Goals (SDGs), proved to be one of the central themes of the Spring Meetings. While new World Bank Group President David Malpass, who began his five-year term on 9 April, eased the nerves of some shareholders by issuing multiple statements of support for the Bank’s climate action plan – a concern given his previous evasion of questions about the Bank’s role in fighting climate change during US Senate hearings in November 2018 while a US Treasury official – the urgent need for climate finance remains. “Shortfalls in decisive action persist despite the blueprint provided by the Paris Agreement. We must go far beyond rhetoric. The moment calls for a robust response to protect economic growth from the risks of climate change and secure continued progress,” said Benson Wase, Finance Minister of the Republic of Marshall Islands and current chair of the V20, in the group’s press release. With the promised private finance for development that has been the focus of the Bank and other MDBs over the last several years yet to materialise, it seems, as Deputy Secretary-General Mohammed noted, when it comes to securing climate finance, there are more questions than answers for climate vulnerable countries.